Accel Tune-Up Point Sets have heavier springs which resist point float, while large, radiused tungsten contacts provide crisp circuit-breaking for peak coil output. The high strength phenolic rubbing blocks provide superior durability when used with heavy spring tension. Racing Points Sets are equipped with severe duty 48 oz. spring tension to prevent "points float" at engine speeds to 9,000 RPM (These are NOT recommended for daily drivers or street vehicles). High Performance Points Sets are equipped with heavy duty 32 oz. spring tension to prevent "points float" at engine speeds to 6,500 RPM. Heavy Duty Points Sets are equipped with 23 oz. 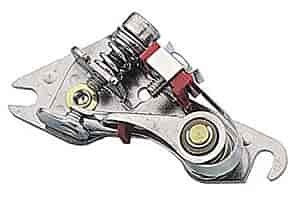 spring tension to prevent "points float" at engine speeds to 5,000 RPM. Does Accel 110128 fit your vehicle?